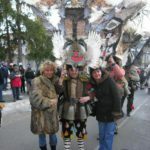 See you at the event – should be well worth attending. If anyone is interested in a little pre-confernece rainforest hiking for 2-3 days before the event – message me. A recent paper in Science authored Ilya Bobrovskiy, Janet Hope and colleagues from ANU, the Russian Academy and European institutions has remarkably (and convincingly) discovered molecules of fat in Dickinsonia, a marine genus of the Ediacaran biota. This has confirmed that the 558 million year old Dickinsonia is the earliest animal in the geological record and maybe a presursor to – you! The strange creature called Dickinsonia, which grew up to 1.4 metres in length and was oval shaped with rib-like segments running along its body, was part of the Ediacara Biota that lived on Earth 20 million years prior to the ‘Cambrian explosion’ of modern animal life. The Ediacara biota are a diverse assemblage of macroscopic body forms that appear in the sedimentary rock record between 570 million and 541 million years ago. First recognized in Namibia and Australia, these remarkable organisms have since been found in Russia, China, Canada, Great Britain, and other regions. Although they immediately preceded the rapid appearance and diversification of animals in the Cambrian (541 million to 485 million years ago), their position within the tree of life has long been a puzzle. 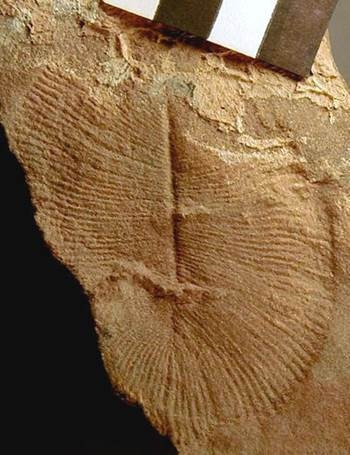 Some Ediacaran fossils appear segmented, but most lack obvious characters such as appendages, a mouth, or a gut that might link them to animal clades. 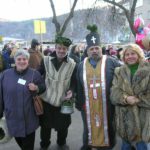 Bobrovskiy et al. conducted an analysis using lipid biomarkers obtained from Dickinsonia fossils and found that the fossils contained almost exclusively cholesteroids, a marker found only in animals. Thus, Dickinsoniawere basal animals. 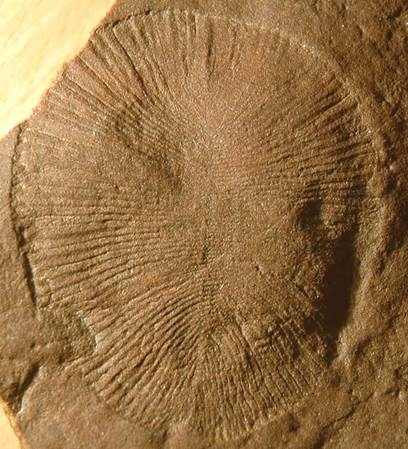 This supports the idea that the Ediacaran biota may have been a precursor to the explosion of animal forms later observed in the Cambrian, about 500 million years ago. Obtaining evidence of cholesteroids first involved finding exceptionally well preserved fossils. The Dikinsonia fossils used in this study came from a narrow strata in the remote White Sea are of Russia. 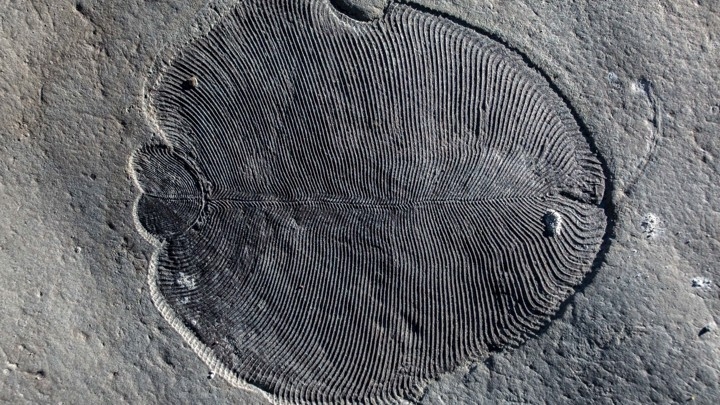 Lead senior researcher Associate Professor Jochen Brocks said the ‘Cambrian explosion’ was when complex animals and other macroscopic organisms—such as molluscs, worms, arthropods and sponges—began to dominate the fossil record. “The fossil fat molecules that we’ve found prove that animals were large and abundant 558 million years ago, millions of years earlier than previously thought,” said Associate Professor Jochen Brocks from the ANU Research School of Earth Sciences. The enigmatic Ediacara biota (571 million to 541 million years ago) represents the first macroscopic complex organisms in the geological record and may hold the key to our understanding of the origin of animals. Ediacaran macrofossils are as “strange as life on another planet” and have evaded taxonomic classification, with interpretations ranging from marine animals or giant single-celled protists to terrestrial lichens. Here, we show that lipid biomarkers extracted from organically preserved Ediacaran macrofossils unambiguously clarify their phylogeny. Dickinsonia and its relatives solely produced cholesteroids, a hallmark of animals. 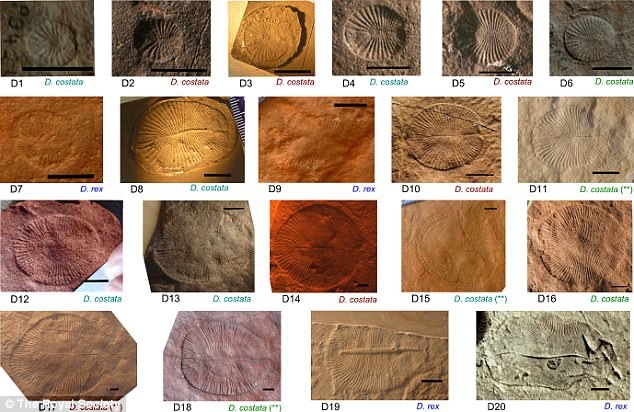 Our results make these iconic members of the Ediacara biota the oldest confirmed macroscopic animals in the rock record, indicating that the appearance of the Ediacara biota was indeed a prelude to the Cambrian explosion of animal life. Natural Resource Governance Institute has issued a report on revenues received from listed mining companies in Ghana. As many who have done the cashflow analysis have long known that a free carried interest, funded out of cashflow is a less than effective tool for garnering rent from resource projects. Projects can often take many years to repay capital and if this period corresponds with low or stagnant commodity prices then dividend payments may be low. In effect the state is fully exposed to commodity price and operational risks. A better solution is a competitive royalty, fee and taxation environment which is adequately regulated. One of the issues with a carried interest is that this often involves representation on the board of the operating entity and as such creates immediate conflicts of interest for directors and heated domestic competition for these positions. That said, there are often political arguments for a carried interest, arguments about national interest. In addition it has been argued that being represented on the board of the operating entity allows governments to “keep an eye on” the operator. A better solution is robust oversight by a suitably trained and funded Department of Mines. In Ghana the majority of international mining companies, including Asanko Gold, Golden Star Resources, Endeavour Mining, Kinross Gold, Perseus Mining and Xtra-Gold Resources, have disclosed payments-to-governments reports under the Extractive Sector Transparency Measures Act (ESTMA) in Canada. In addition Gold Fields, AngloGold Ashanti and Newmont Mining have made voluntary disclosures regarding the payments they make to the Ghanaian government. Data were sourced from companies complying with the Canadian, Extractive Sector Transparency Measures Act (ESTMA). In 2017 nearly three quarters of the payments to Ghanaian government entities by ESTMA companies in the gold sector arose from royalties, with five companies paying a total of USD 57 million. A further 22 percent of the payments from these ESTMA companies were in the form of corporate income tax. 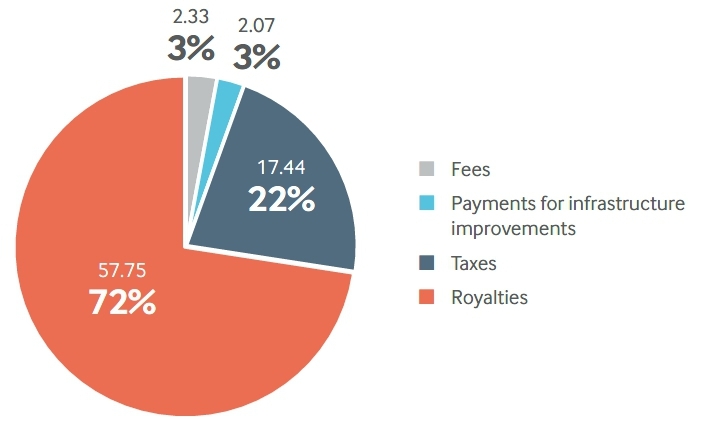 While six operating companies paid royalties in 2017, only two, Kinross Gold Corporation and Endeavour Mining paid corporate taxes. The government of Ghana holds these shares and the non-tax revenue unit of the Ministry of Finance collects the revenues. The government is provided this equity interest without having to make financial contributions to the development or operations of the project. The government has equity share interests in every gold mining operation in the country bar those owned by Newmont Mining or AngloGold Ashanti following the signing of updated mining development agreements. In the case of AngloGold Ashanti, the government has a stake of 1.55 percent in the global company AngloGold Ashanti Limited. The NRGI report concludes that “the payments-to-governments disclosures made by international mining companies operating in the country suggest that if revenue generation is the primary purpose of this state equity participation, then the government may want to reconsider this approach”. This has been evident to many in the industry for a very long time. Just received the above titled book from Elsevier for review. I had the great pleasure of spending some time in the field in Myanmar with Andrew Mitchell in 2017 and this important contribution by him is a remarkable testament to his life’s work. He has enormous knowledge of the geology and mineral deposits of Myanmar and that is obvious in this text. I will be undertaking a chapter-by-chapter review of the text over the coming 6 weeks or so and posting here. A quick review: The text is well written, beautifully presented and the numerous maps provide new geological insights. 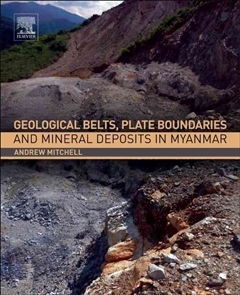 As a largely personal contribution this is an unusual work and will be important to minerals industry professionals and researchers and importantly, geoscience educators in Myanmar. To the Daily Alta California, it was “the great discovery of the age”. 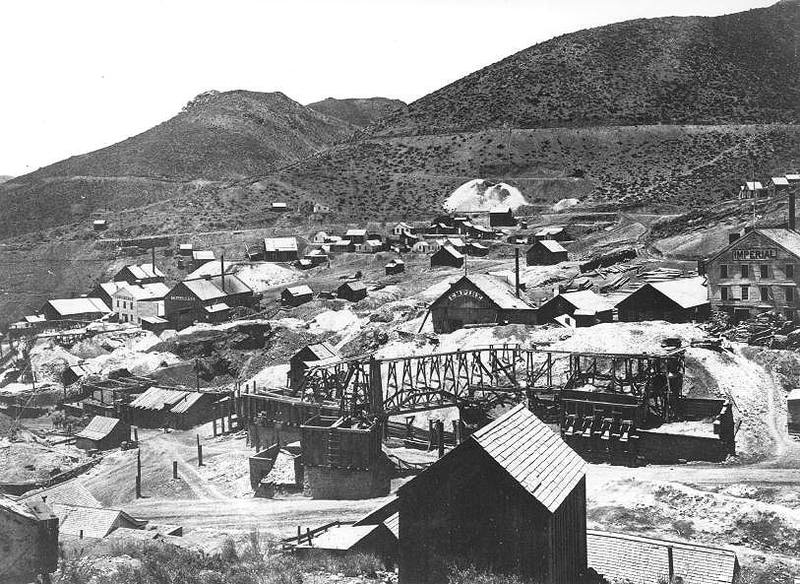 After emerging from the underground at the California Mine on the Comstock Lode Dan de Quille called it “the richest mineral discovery in the world’s history” and he named it The Big Bonanza. In a field of exceedingly high-grade mineralization the Big bonanza would generate immense wealth. “Not a pebble in the crosscut was worth less than US$600 per ton and no small sample could be reasonably assayed for fear of grabbing a sulphuret nodule that would run the chunk into the thousands of dollars a ton.” Bear in mind these are 1870 dollars, likely worth US$20,000 per tonnes in today’s dollars. 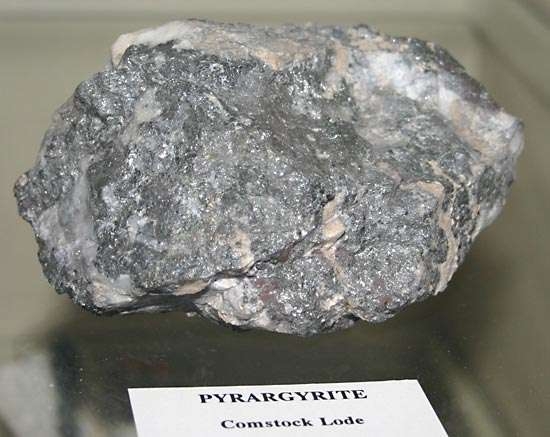 Pyrargyrite silver ore from the Comstock Lode, Storey Co., Nevada, U.S. 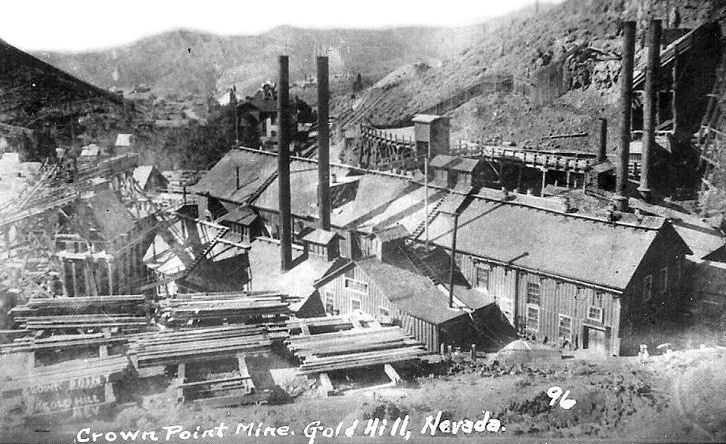 The Bonanza King is a well researched history of the Comstock Lode and characters involved. The book underlines the importance and occasional reward for focused hard work in the industry. Strongly recommended for mining folks. Pyrargyrite is a sulfosalt mineral consisting of silver sulfantimonide, Ag3SbS3. 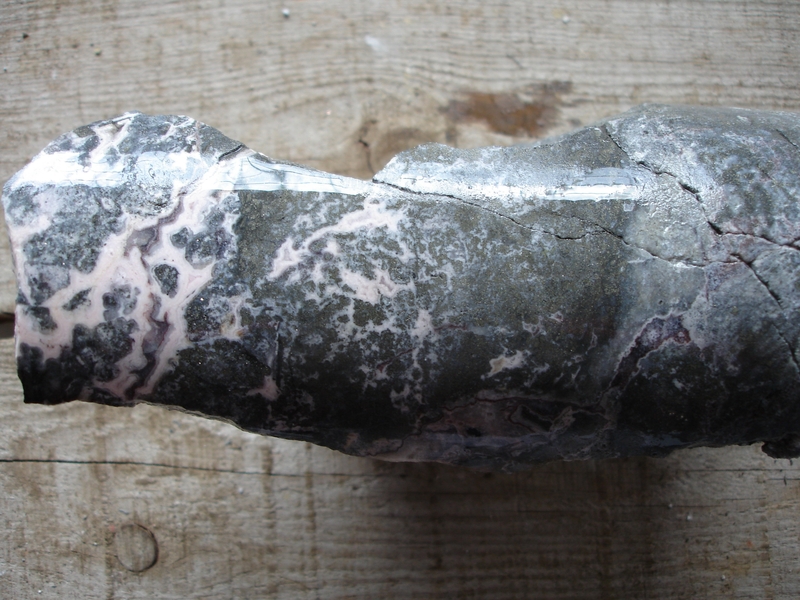 Known also as dark red silver ore or ruby silver, it is an important source of the metal. Crouch, Gregory. The Bonanza King: John Mackay and the Battle over the Greatest Riches in the American West. Steven F. Hayward, is currently the Thomas Smith Distinguished Fellow at the John M. Ashbrook Center at Ashland University, where he directs the Ashbrook Center’s new program in political economy. For the last decade he was the F.K. Weyerhaeuser Fellow in Law and Economics at the American Enterprise Institute in Washington, D.C., and a Senior Fellow at the Pacific Research Institute in San Francisco. Climate change is over. 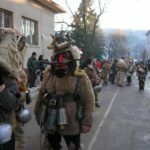 No, I’m not saying the climate will not change in the fu­ture, or that human influ­ence on the climate is negli­gible. I mean simply that climate change is no longer a pre-eminent policy issue. All that remains is boilerplate rhetoric from the political class, frivolous nuisance lawsuits, and bureaucratic mandates on behalf of special-interest renewable-energy rent seekers. Judged by deeds rather than words, most national governments are backing away from forced-marched decarbonization. You can date the arc of climate change as a policy priority from 1988, when highly publicized congressional hear­ings first elevated the issue, to 2018. President Trump’s ostentatious with­drawal from the Paris Agreement merely ratified a trend long becom­ing evident. A good indicator of why climate change as an issue is over can be found early in the text of the Paris Agreement. The “nonbinding” pact declares that climate action must in­clude concern for “gender equality, empowerment of women, and inter-generational equity” as well as “the importance for some of the concept of ‘climate justice.’ ” Another is Sarah Myhre’s address at the most recent meeting of the American Geophysical Union, in which she proclaimed that climate change cannot fully be ad­dressed without also grappling with the misogyny and social injustice that have perpetuated the problem for decades. 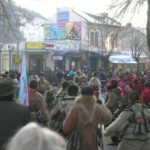 The descent of climate change into the abyss of social justice identity politics represents the last gasp of a cause that has lost its vitality. Climate alarm is like a car alarm—a blaring noise people are tuning out. 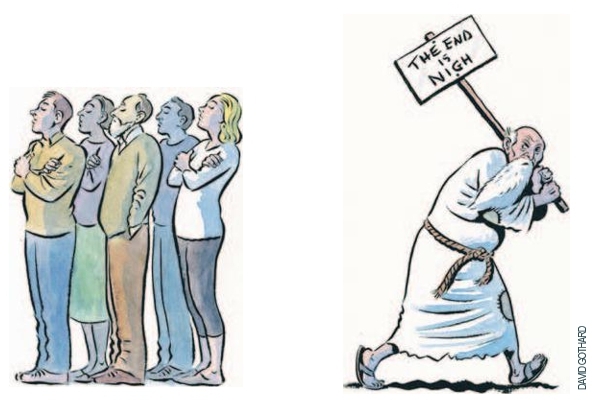 Political scientist Anthony Downs de­scribed the downward trajectory of many political movements in an arti­cle for the Public Interest, “Up and Down With Ecology: The ‘Issue-Attention” published in 1972, long before the climate-change campaign began. Observing the movements that had arisen to address issues like crime, poverty and even the U.S.-So­viet space race, Mr. Downs discerned a five-stage cycle through which po­litical issues pass regularly. 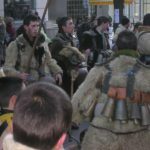 The first stage involves groups of experts and activists calling attention to a public problem, which leads quickly to the second stage, wherein the alarmed media and political class discover the issue. 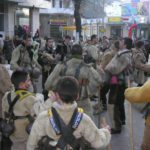 The second stage typically includes a large amount of euphoric enthusiasm—you might call it the “dopamine” stage—as activists conceive the issue in terms of global peril and salvation. This tendency ex­plains the fanaticism with which di­vinity-school dropouts Al Gore and Jerry Brown have warned of climate change. While opinion surveys find that roughly half of Americans regard climate change as a problem, the is­sue has never achieved high salience among the public, despite the drum­beat of alarm from the climate cam­paign. Americans have consistently ranked climate change the 19th or 20th of 20 leading issues on the an­nual Pew Research Center poll, while Gallup’s yearly survey of envi­ronmental issues typically ranks cli­mate change far behind air and wa­ter pollution. “In the final stage,” Mr. Downs concludes, “an issue that has been re­placed at the center of public concern moves into a prolonged limbo—a twi­light realm of lesser attention or spasmodic recurrences of interest.” Mr. Downs predicted correctly that environmental issues would suffer this decline, because solving such is­sues involves painful trade-offs that committed climate activists would rather not make. Scientists who are genuinely wor­ried about the potential for cata­strophic climate change ought to be the most outraged at how the left po­liticized the issue and how the inter­national policy community narrowed the range of acceptable responses. Treating climate change as a planet-scale problem that could be solved only by an international regulatory scheme transformed the issue into a political creed for committed believ­ers. Causes that live by politics, die by politics. ESA has just released the most detail magnetic data on the lithosphere from its Swarm three satellite constellation. Launched on 22 November 2013, Swarm is the fourth in a series of pioneering Earth Explorer research missions, following on from GOCE, SMOS and CryoSat. Is also ESA’s first constellation of satellites to advance our understanding of how Earth works. 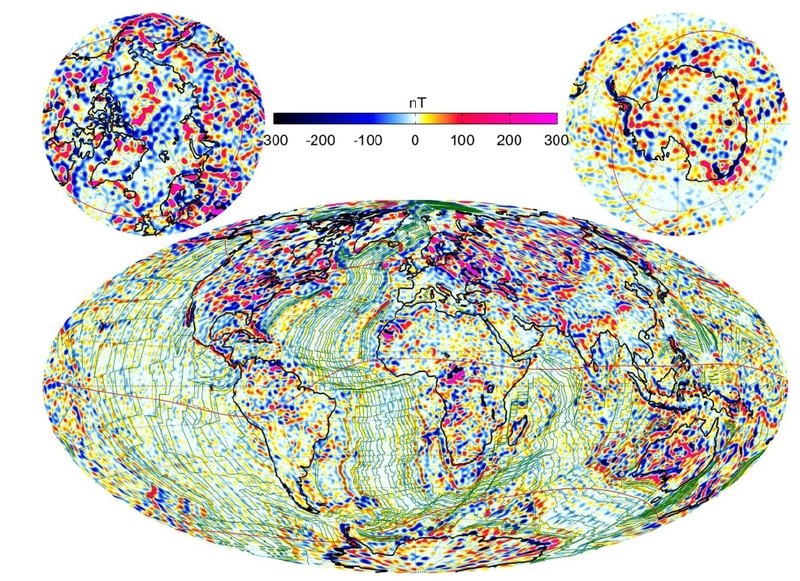 This is the most detailed map ever of the tiny magnetic signals generated by Earth’s lithosphere. The map, a video of which is seen here. The data is being used to understand more about Earth’s geological history, is thanks to four years’ of measurements from ESA’s trio of Swarm satellites, historical data from the German CHAMP satellite and observations from ships and aircraft. Erwan Thebault from the University of Nantes in France said, “This is the highest resolution model of the lithospheric magnetic field ever produced. “With a scale of 250 km, we can see structures in the crust like never before. And, we have gained even finer detail in some parts of the crust, such as beneath Australia, where measurements from aircraft have mapped at resolution of 50 km. Map of field vertical component Z, at the Earth’s surface from the LCS-1 model for spherical harmonic degrees n-16-185. Green lines are isochrones. Most of Earth’s magnetic field is generated deep within the outer core by an ocean of superheated, swirling liquid iron, but there are also much weaker sources of magnetism. The Swarm constellation has been used to yield some discoveries about these more elusive signals, such as that from Earth’s lithosphere. A small fraction of the magnetic field comes from magnetised rocks in the upper lithosphere, which includes Earth’s rigid crust and upper mantle. This lithospheric magnetic field is very weak and therefore difficult to detect from space. As new oceanic crust is created through volcanic activity, iron-rich minerals in the upwelling magma are oriented to magnetic north at the time and solidified as the magma cools. Since magnetic poles flip back and forth over time, the solidified magma due to mantle upwelling at mid-oceanic ridges forms magnetic ‘stripes’ on the seafloor which provide a record of Earth’s magnetic history. These magnetic imprints on the ocean floor can be used as a sort of time machine, allowing past field changes to be reconstructed and showing the movement of tectonic plates from hundreds of million years ago until the present day. 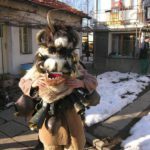 Here is a brief paper, by Ralica Sabeva Vassilka Mladenova and Aberra Mogessie on the gold deposits around the small western Bulgarian town of Breznik. I acquired this project for Euromax Resources Limited back in 2003 and we explored this until my departure in 2010. A rather nice intermediate sulphidation gold deposit which has now had the necessary fluid inclusion and sulphur isotope work conducted by Bulgarian and Austrian researchers. 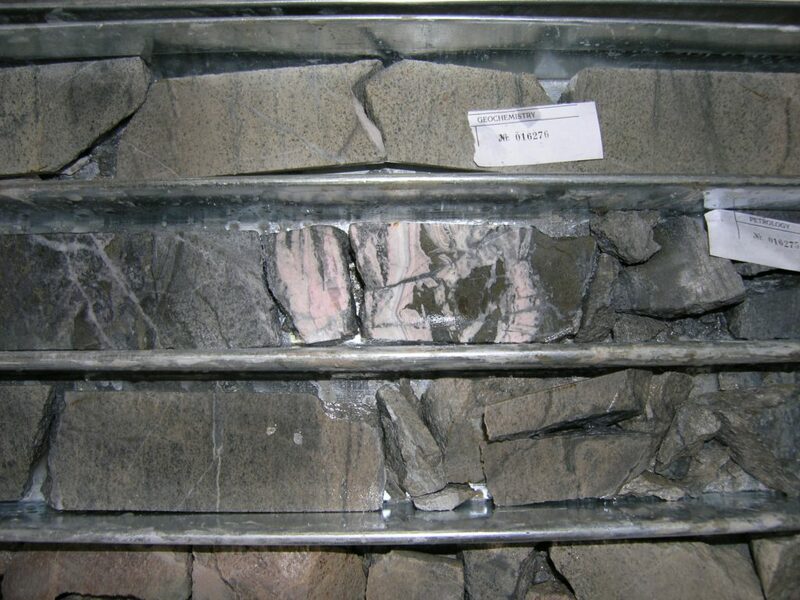 Our intention while I was CEO was to devleop this deposit using adits and an internal winze. .
Fluid evolution from a low sulphidation through later intermediate (precious metals) stage. Simplified geological map of Western Srednogorie zone in Bulgaria with the main paleovolcanic centres (after Dabovski et al. (2009) modified by Velev et al. 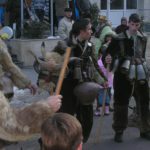 (2012)). (B) Simplified geological map of Milin Kamak area. 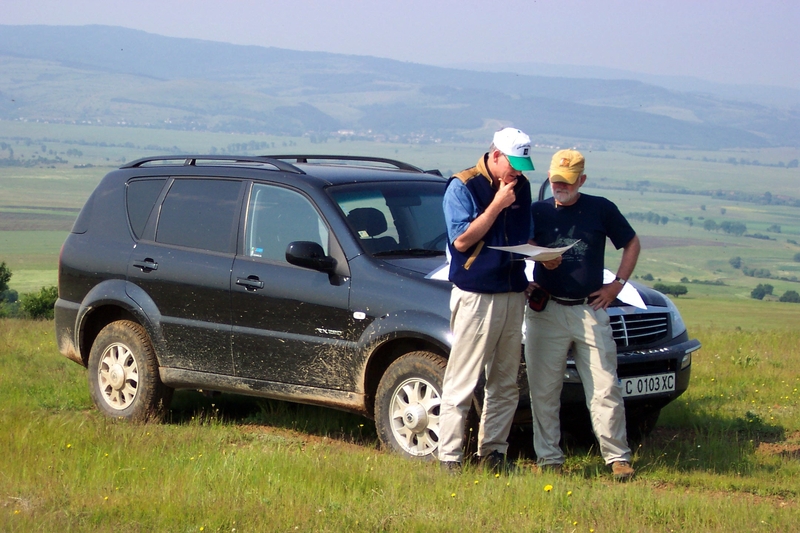 The Milin Kamak gold-silver deposit is located in Western Srednogorie zone, 50 km west of Sofia, Bulgaria. This zone belongs to the Late Cretaceous Apuseni-Banat-Timok-Srednogorie magmatic and metallogenic belt. 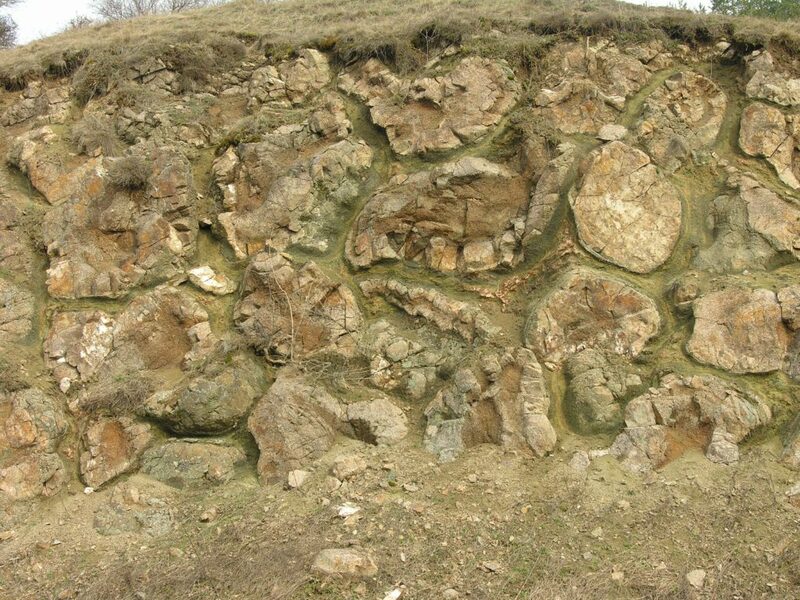 The deposit is hosted by altered trachybasalt to andesitic trachybasalt volcanic and volcanoclastic rocks with Upper Cretaceous age, which are considered to be products of the Breznik paleovolcano. 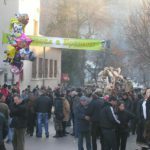 Milin Kamak is the first gold-silver intermediate sulfidation type epithermal deposit recognized in Srednogorie zone in Bulgaria. It consists of eight ore zones with lengths ranging from 400 to 1000 m, widths from several cm to 3–4 m, rarely to 10–15 m, an average of 80–90 m depth (a maximum of 200 m) and dip steeply to the south. The average content of gold is 5.04 g/t and silver – 13.01 g/t. 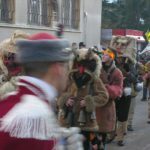 The styles of alteration are propylitic, sericite, argillic, and advanced argillic. Ore mineralization consists of three stages. Quartz-pyrite stage I is dominated by quartz, euhedral to subhedral pyrite, trace pyrrhotite and hematite in the upper levels of the deposit. Quartz-polymetallic stage II is represented by major anhedral pyrite, galena, Fe-poor sphalerite; minor chalcopyrite, tennantite, bournonite, tellurides and electrum; and trace pyrrhotite, arsenopyrite, marcasite. Gangue minerals are quartz and carbonates. The carbonate-gold stage III is defined by deposition of carbonate minerals and barite with native gold and stibnite. Fluid inclusions in quartz are liquid H2O-rich with homogenization temperature (Th) ranging from 238 to 345 °C as the majority of the measurements are in the range 238–273 °C. Ice-melting temperatures (Tm) range from −2.2 to −4.1 °C, salinity – from 3.7 to 6.6 wt.% NaCl equiv. These measurements imply an epithermal environment and low- to moderate salinity of the ore-forming fluids. δ34S values of pyrite range from −0.49 to +2.44‰. The average calculated δ34S values are 1.35‰. The total range of δ34S values for pyrite are close to zero suggesting a magmatic source for the sulfur. Late stage intermediate sulphidation mineralization at Breznik. Quartz-pyrite stage I is dominated by quartz, euhedral to subhedral pyrite, trace pyrrhotite and hematite in the upper levels of the deposit. Quartz-polymetallic stage II is represented by major anhedral pyrite, galena, Fe-poor sphalerite; minor chalcopyrite, tennantite, bournonite, tellurides and electrum; and trace pyrrhotite, arsenopyrite, marcasite. Gangue minerals are quartz and carbonates. The carbonate-gold stage III is defined by deposition of carbonate minerals and barite with native gold and stibnite. 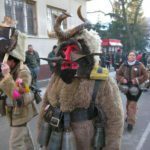 Breznik is a delightful small town in western Bulgaria and well worth a visit. 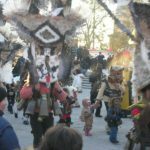 In the middle of winter across the Balkans, Kukeri festivals allow for mid-winter celebrations. Melting sea ice could help cool the planet by flooding the atmosphere with particles that deflect sunlight. Immense quantities of reflective compounds, emitted by marine microbes, act like a handbrake on global warming. The study, published by the American Meteorological Society, suggests an overlooked source of these so-called aerosols — algae living in ice — could jam the handbrake on even harder. Lead author Albert Gabric said with the Arctic expected to see ice-free summers within a decade, far more of the aerosols would be emitted. We examine the relationship between sea ice dynamics, phytoplankton biomass and emissions of marine biogenic aerosols in both Arctic and Southern Oceans. Accurate estimation of the climate sensitivity requires a better understanding of the nexus between polar marine ecosystem responses to warming, changes in sea ice extent and emissions of marine biogenic aerosol (MBA). Sea ice brine channels contain very high concentrations of MBA precursors that once ventilated have the potential to alter cloud microphysical properties, such as cloud droplet number, and the regional radiative energy balance. In contrast to temperate latitudes, where the pelagic phytoplankton are major sources of MBAs, the seasonal sea ice dynamic plays a key role in determining MBA concentration in both the Arctic and Antarctic. We review the current knowledge of MBA sources and the link between ice melt and emissions of aerosol precursors in the polar oceans. We illustrate the processes by examining decadal scale time series in various satellite-derived parameters such as aerosol optical depth (AOD), sea ice extent and phytoplankton biomass in the sea ice zones of both hemispheres. The sharpest gradients in aerosol indicators occur during the spring period of ice melt. In sea ice covered waters, the peak in AOD occurs well before the annual maximum in biomass in both hemispheres. The results provide strong evidence that suggests seasonal changes in sea ice and ocean biology are key drivers of the polar aerosol cycle. The positive trend in annual mean Antarctic sea ice extent is now almost one-third of the magnitude of the annual mean decrease in Arctic sea ice, suggesting the potential for different patterns of aerosol emissions in the future. “Whether that can slow the rate of warming of the Arctic is the trillion-dollar question,” said Dr Gabric, a marine biogeo­chemist with Griffith University in Brisbane. Climate scientists have long known that aerosols help mitigate global warming by bouncing sunrays back into space, and by altering clouds to make them more reflective. Experts believe half of the ­potential warming from greenhouse gases may be offset in this way. Much research has focused on aerosols produced artificially, through the burning of fossil fuels and vegetation. Scientists worry that if China switched to renewable sources of energy overnight, it could trigger a massive surge in warming. Aerosols are also produced naturally by volcanoes — such as the 1991 eruption of Mount Pinatubo in The Philippines, which is credited with cutting global temperatures by about 0.5C for two years — and by marine ecosystems. Algae known as “phytoplankton” are a major contributor, with increasingly massive blooms of these marine creatures emerging in the warming Arctic waters. The new study analysed terabytes of satellite data to track atmos­pheric aerosol concen­trations. 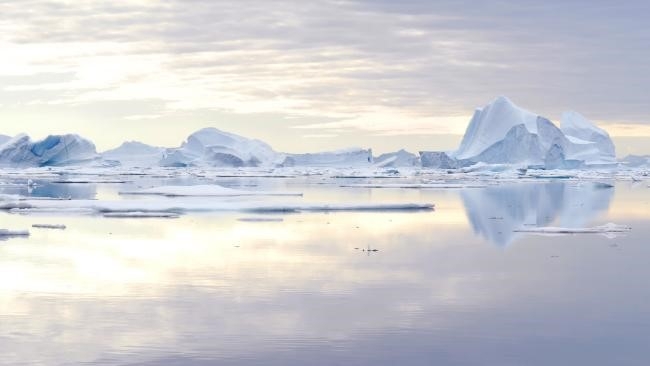 For the first time, it identified sea ice as a “very strong source” of the airborne particles. Dr Gabric said “ice algae” had evolved to tolerate the subzero temperatures of sea ice and the water that formed it. 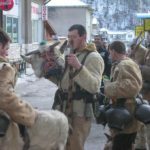 They used a compound called dimethyl sulfide as an “antifreeze” to survive the chill. “When the sea ice melts during spring, these algae don’t need that protection any more. They expel these compounds, which are degassed to the atmosphere and converted into sulfate aerosols very similar to what you get from burning sulphur-containing coal. He said the process had “absolutely not” been factored into the Intergovernmental Panel on Climate Change models of global warming. “The whole aerosol question and its relationship to warming is the biggest uncertainty to projecting what’s going to happen this century. “This is a new area of ­research, primarily because people can’t get up there and measure it very easily. You need an ice­breaker and a big gun to shoot any polar bears that might want to eat you,” he said. The Variscan and related North American orogenies which now total 6,000 kilometres of strike, were caused by the opening and closing of the Rheic Ocean over a 100 million year period from 440MA to 320MA. This period saw the creation of several minor oceans and seaways, repeated periods of rifting and subduction and ultimately with the amalgamation of Laurussia and Gondwana, formation of the Pangea super-continent. Wolfgang Franks and colleagues have undertaken a comprehensive review and re-interpretation of the oceanic history of the Variscan domain. They attribute the complex geology to the opening and closing of 5 oceans or seaways, rifting and repeated subduction events. As a consequence of this complex tectonism, Variscan Europe is well endowed with mineral deposits although few are in production. Indeed this is where the industrial exploitation of Cu, Pb, Zn, Ag and Au commenced in post Roman times. The proposed complexity is very similar to that observed along the margins of the Tethyan Ocean to the east during a later period. This paper is well worth a detailed review. In the comments below we summarize the Franks et al paper to produce a history of the Variscan. 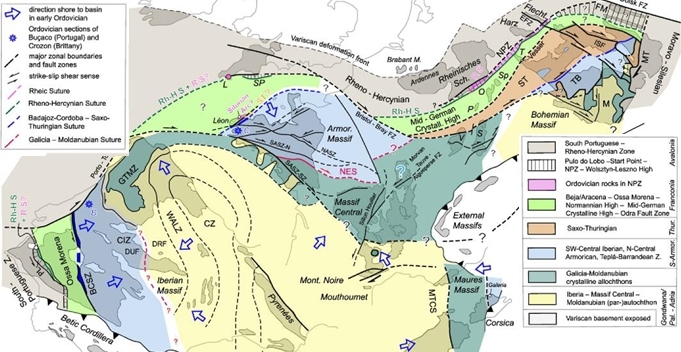 Additional rifting in the Silurian (~440MA) along the NW margin of Africa resulted in the formation of the Saxo-Thuringian and the Galicia-Moldanubian seaways and the separation of the ATA elements from each other and ATA from Gondwana (with Palaeo-Adria to the immediate east). This orogenesis extended from the Carboniferous into the Middle Permian with collisional shortening of more than 1,000 km. Geological evidence, supported by biogeographical data and in accord with palaeomagnetic constraints, indicates that “one ocean” models for the Variscides should be discarded, and confirms, instead, the existence of three Gondwana-derived microcontinents which were involved in the Variscan collision: Avalonia, North Armorica (Franconia and Thuringia subdivided by a failed Vesser Rift), and South Armorica (Central Iberia/Armorica/ Bohemia), all divided by small oceans. In addition, parts of south-eastern Europe, including Adria and Apulia, are combined here under the new name of Palaeo-Adria, which was also Peri-Gondwanan in the Early Palaeozoic. Oceanic separations were formed by the break-up of the northern Gondwana margin from the Late Cambrian onwards. Most of the oceans or seaways remained narrow, but – much like the Alpine Cenozoic oceans – gave birth to orogenic belts with HP-UHP metamorphism and extensive allochthons: the Saxo-Thuringian Ocean be­tween North and South Armorica and the Galicia-Moldanubian Ocean between South Armorica and Palaeo-Adria. Only the Rheic Ocean between Avalonia and peri-Gondwana was wide enough to be unambiguously recorded by biogeography and palaeomagnetism, and its north-western arm closed before or during the Emsian in Europe. Ridge subduction under the northernmost part of Armorica in the Emsian created the narrow and short-lived Rheno-Hercynian Ocean. It is that ocean (and not the Rheic) whose opening and closure controlled the evolution of the Rheno-Hercynian fold-belt in south-west Iberia, south-west England, Germany, and Moravia (Czech Republic). Devonian magmatism and sedimentation set within belts of Early Variscan deformation and metamor­phism are probably strike-slip-related. The first arrival of flysch on the forelands and/or the age of deformation of foreland sequences constrains the sequential closure of the Variscan seaways (Galicia-Moldanubian in the Givetian; Saxo-Thuringian in the Early Famennian; Rheno-Hercynian in the Tournaisian). Additional Mid- to Late Devonian and (partly) Early Carboniferous magmatism and extension in the Rheno-Hercynian, Saxo-Thuringian and Galicia-Moldanubian basins overlapped with Variscan geodynamics as strictly defined. 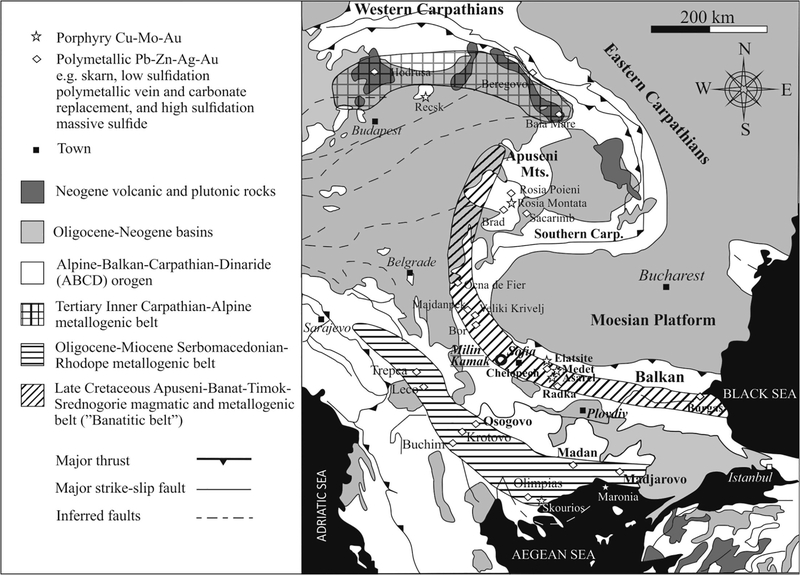 The Early Carboniferous episode was the start of episodic anorogenic heating which lasted until the Permian and probably relates to Tethys rifting.